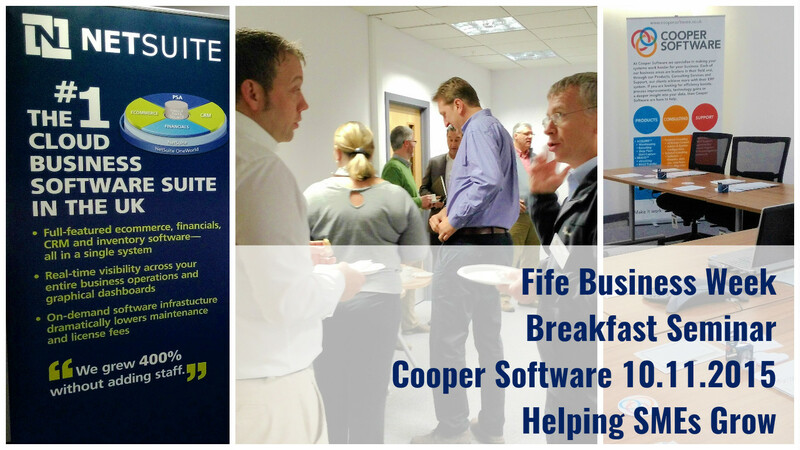 As part of the 2015 Fife Business Week programme of events, Cooper Software held a successful NetSuite breakfast seminar on Tuesday 10th November, targeted at SMEs. The free to attend session was presented by Dean Gardner, Cooper Software’s Director of Strategic Projects and Shane Harris, one of the company’s specialist ERP Consultants and was attended by 12 representatives from local businesses, covering a variety of industry sectors. The session was very well received with attendees citing Cooper Software’s sharing of our own Business Intelligence Review (BIR), conducted prior to implementing NetSuite as one of the most valuable parts of the seminar. The BIR provides a ‘health check’ of a Company’s existing system and supporting infrastructure in order to identify areas where functional and technical improvements could be made to deliver improved performance and system reliability. Following the review, recommendations are then made as to the best solution for that particular organisation. Cooper Software will be running another NetSuite seminar in early 2016. To register your interest, please contact Helen Soutar at, Helen.soutar@coopersoftware.co.uk or call 01383 840 700.